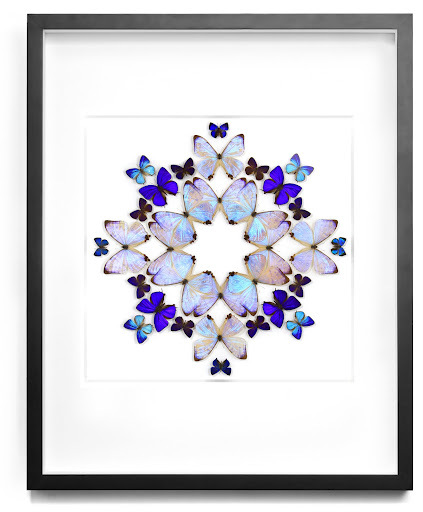 Christopher Marley, The Coleoptera Mosaics, each piece is signed and labeled and no two are exactly alike. Whether we are discussing beetles (25% of all known lifeforms are in this order), bees, moths, butterflies, ants, grasshoppers, or candidas, it should be noted that most of the bugs’ exoskeletons are gorgeous. Bugs usually rely on the defense mechanism of camouflage so as not to be eaten or seen. This mechanism (through the course of evolution) has allowed bugs to have colors as variegated as tree moss, tropical birds, succulents, desert flowers, and rainforest bark. Historically, several species of bugs have been incorporated into ritual objects because of tribal religious significance. In Mexico, live beetle brooches (don’t be squeamish!) are a growing trend. 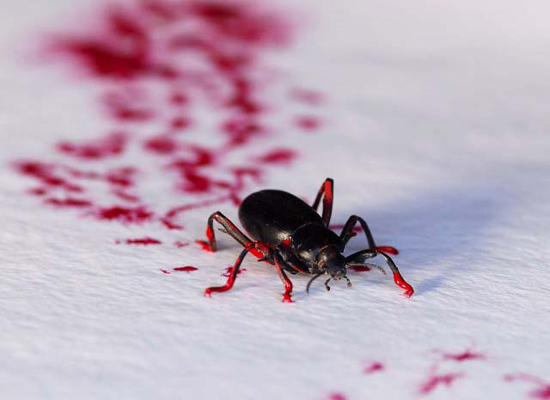 Several living artists have reinvented the idea of scientific insect study and raised the pinning and conservation of insects as an art form. Christopher Marley, “Lumens Prism”, Via. 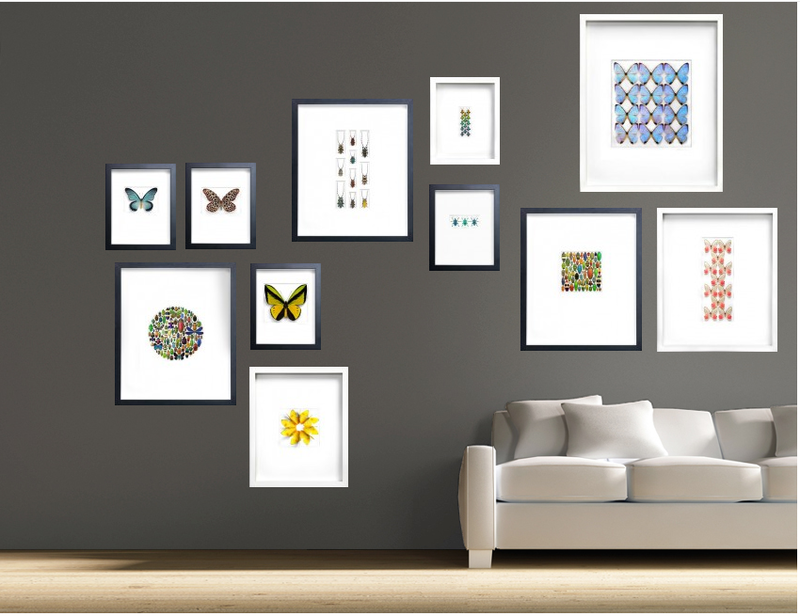 A gallery wall featuring several Christopher Marley creations, for purchase go HERE. 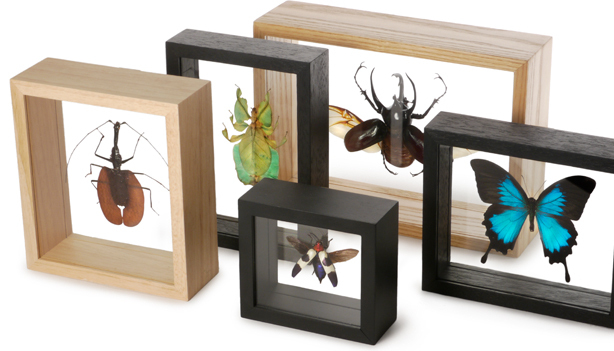 Framed insects via The Evolution Store in Soho, NY. Steven Kutcher works with animals far too small to hold any paintbrush! 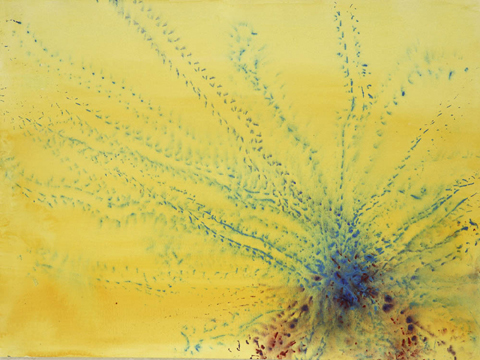 He treats insects as living (and thus, moving) brushes in order to create his canvases. Kutcher’s bug art concept grew out of his work as an insect wrangler for Hollywood films, including “Arachnophobia” and “Spider-Man.” The inspiration came on a Hollywood set in 1985, while working on the Steven Spielberg television project “Amazing Stories.” He explains, “I’ll take a bug in my hand and, leg by leg, [and] load the paint onto each leg.” This concept of letting animals roam free on a surface creates his “masterpieces” – sometimes with sup rising patterns and results! No insects were harmed in the making of his paintings! Steven Kutcher, Starry Night, Hissing Cockroach (Gromphadorhina portentosa), with Gouache on Paper, 18 x 24 in., 2004. Sunrise No. 1., Darkling Beetle (Eleodes sp. 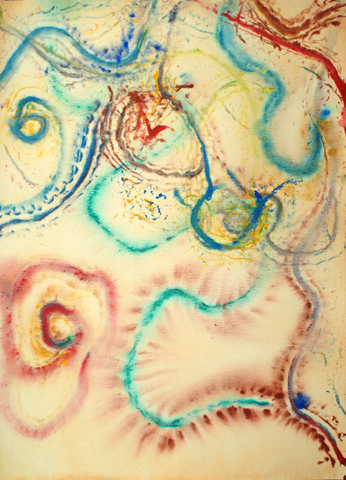 ), With Gouache on Paper, 18 x 24 in., 2004. Bug stationery! 102. Earth Nova, by Darkling Beetle; 103. Butterflies in the Garden No. 1,by Darkling Beetle; 70. Olympic, by Darkling Beetle; (front row, left to right). 93. Fireworks in the Forest by Darkling Beetle; Making Tracks*byDarkling Beetle; 74. Dancing Beetle LL (Lower Left, part of a series of four paintings), by Darkling Beetle. 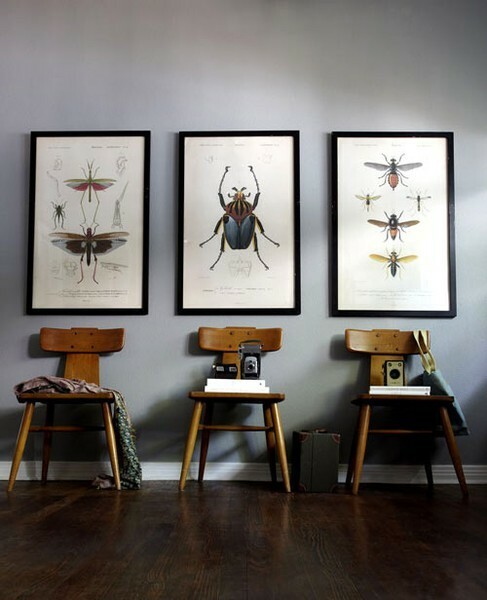 Bug art prints as decor, image from DesignSponge, HERE. 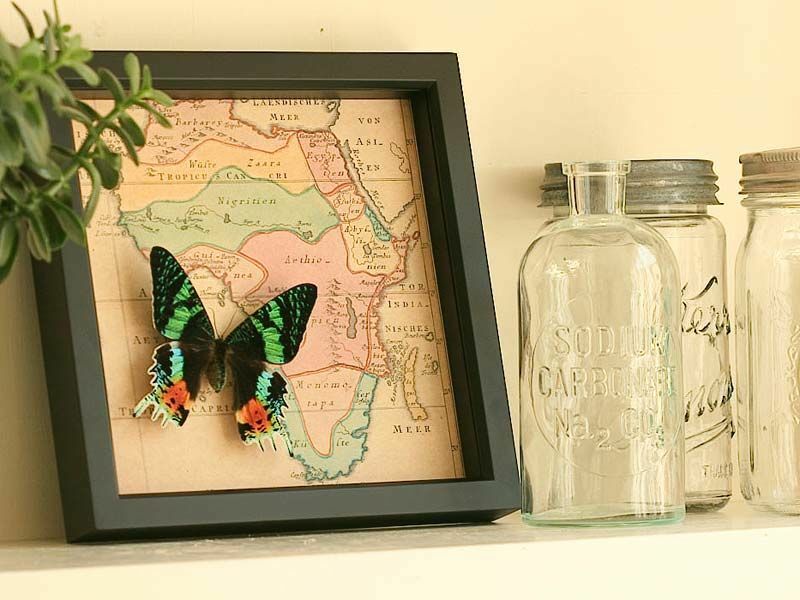 Bug Under Glass is an amazing online retailer that features several styles of bugs, prints, dioramas, and insects on maps! Check it out, HERE. As a teen, Christopher Marley spent 2 years in the Atacama Desert of northern Chile. As a professional photographer his assignments sent him to dozens of countries in Asia, Europe, Africa and the Americas. All he saw and photographed generated a desire to produce a work that would share the awesome variety of insects world-wide. 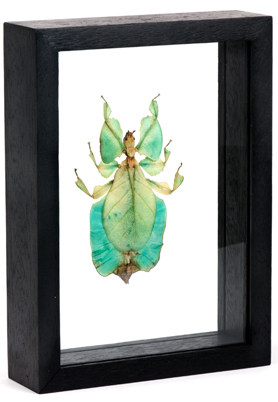 Besides insects, he also has designed items with fossils, minerals, botanicals, bones, and sea life. 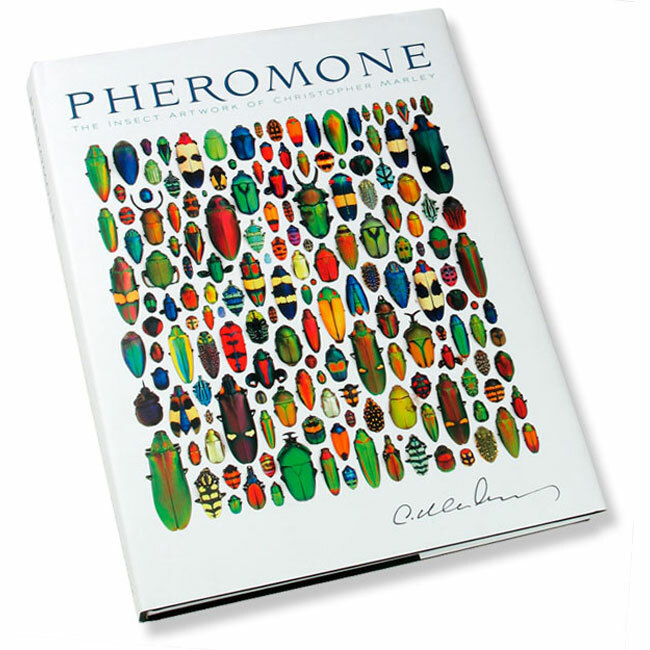 If ACTUAL bugs on the wall are not your cup-of-tea, feel free to purchase this gorgeous coffee table book instead. 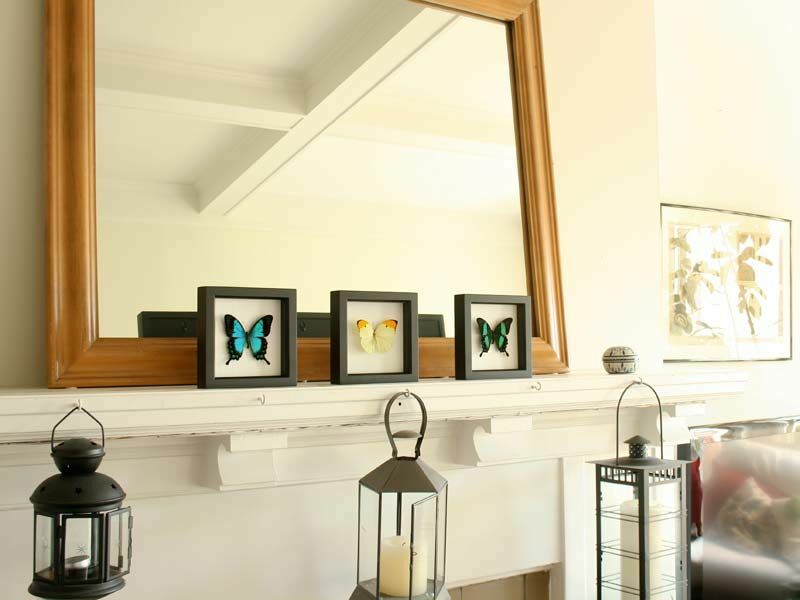 Or you can invest in bug prints, without using the actual insect bodies. Either way – the colors and shapes are inspiring! 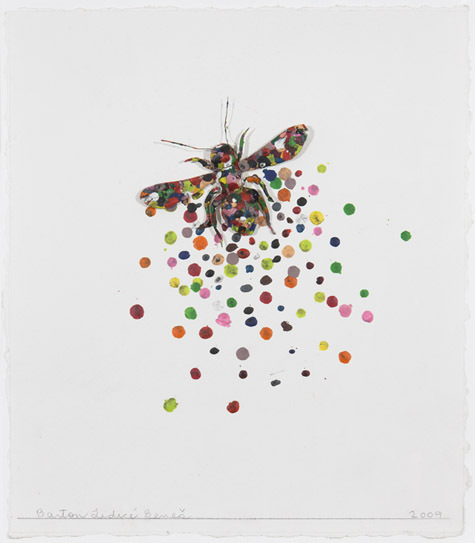 Barton Lidice Benes, Bug, 2009, Mixed-media on paper , 16 x 14 inches, found HERE. 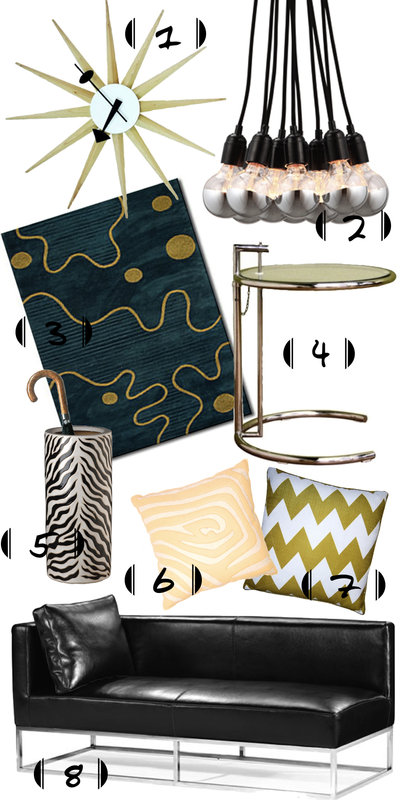 Meet Annabelle of the decor website Stylish Furniture & Decor. Annabelle worked for 10 years as a residential Interior Designer in Washington, DC and New York City, NY. She was inspired to start her new online furniture business because of her love of sourcing and helping to supervise a client’s design process. She believes that a new purchase as simple as one chair can help a home to feel “completely furnished”. She explains, “There is no purchase or project too small – as every piece is an important component.” She describes her website’s offerings as “sleek, “trendy”, and “fashionable”. Her favorite decorative time period is the present (even though I would love to live in Versailles or the Greco-Roman Era, her answer makes much more sense…I do love indoor plumbing)! She explains that, her version of “modern design” means mixing pieces from different periods and having fun with unexpected design. 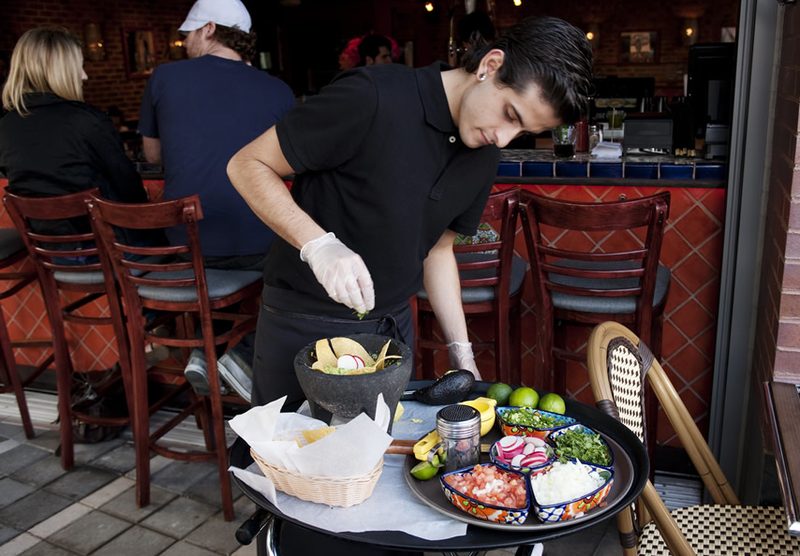 EAT: Mole, a Mexican restaurant on 57 Jane St, at the corner of Hudson St. New York, NY 10014. The mole enchiladas are actually to die for. Image courtesy of Mole, West Village, HERE. SEE: The Hudson River Park is one her favorite things about living in the West Village, she adores being able to access the river walk. 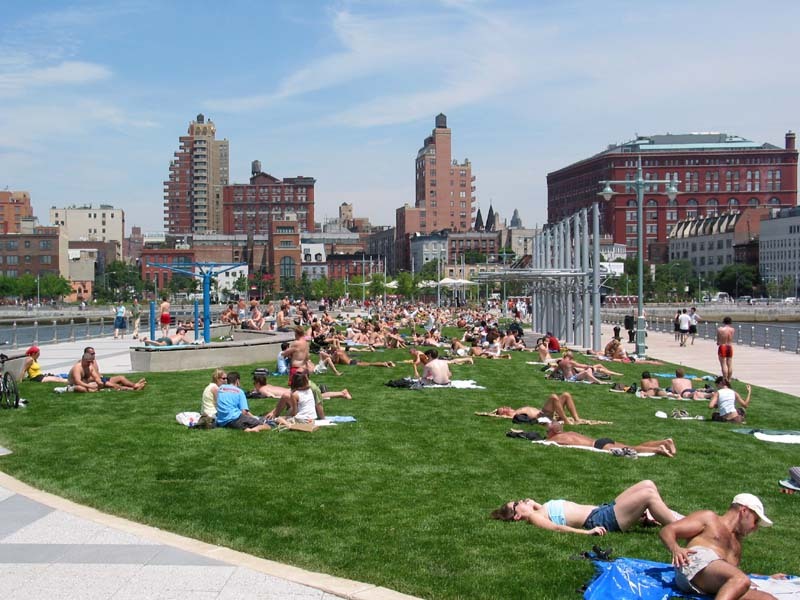 The area is the largest park to be built in Manhattan since the completion of Central Park. It is right along the water and boasts amazing skylines and sunsets. The park also includes tennis courts and skateparks! 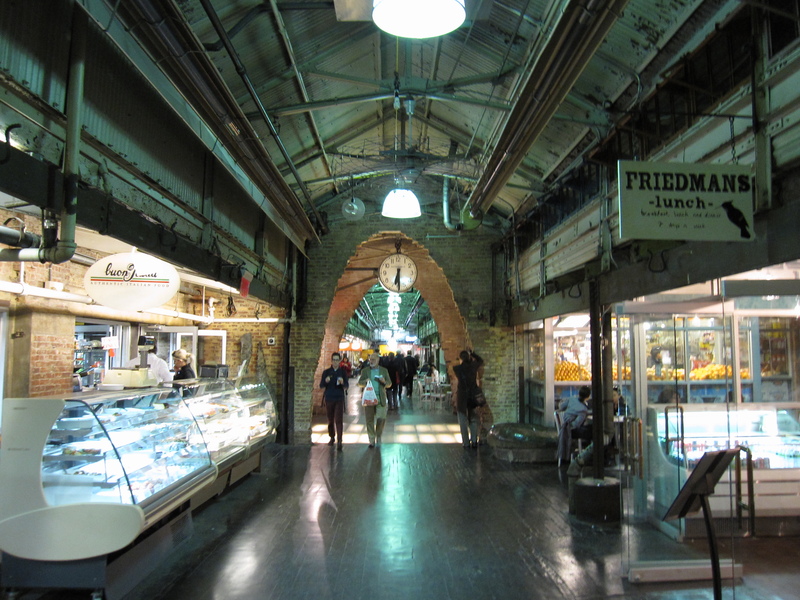 SHOP: Chelsea Market, especially the produce market, The Lobster Place (fresh lobster, fishmongers, and shellfish on ice! ), and Buon Italia. If you plan on picking up ingredients for a gourmet dinner, this is your one-stop shop. Image courtesy of Wikipedia Commons. DO: Sunday afternoon cocktails at any restaurant in the West Village or Chelsea! It’s always lively and fun! Bonus points for finding seats outside on a nice day for people watching. If you love these items, Annabelle has agreed to give The Walkup readers a whopping 10% off all items from today until 5/31/2012, with the code WALKUP. Enjoy perusing! Step 1: Find a friend! I found Kimberley, she’s my go-to crafting buddy. If you have a friend named Kimberley, use her too. Go to your local thrift shop and find cake molds, bowls, or anything circular that is oven safe over 300 Degrees Fahrenheit. 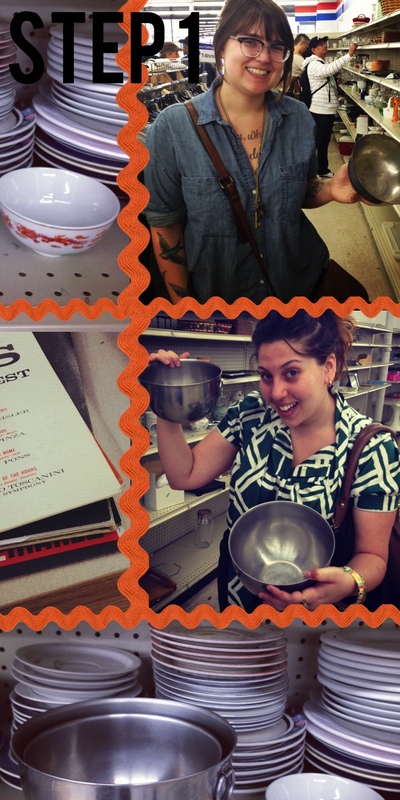 Our bowls were only $1.99. This object will be used to mold your record bowl. 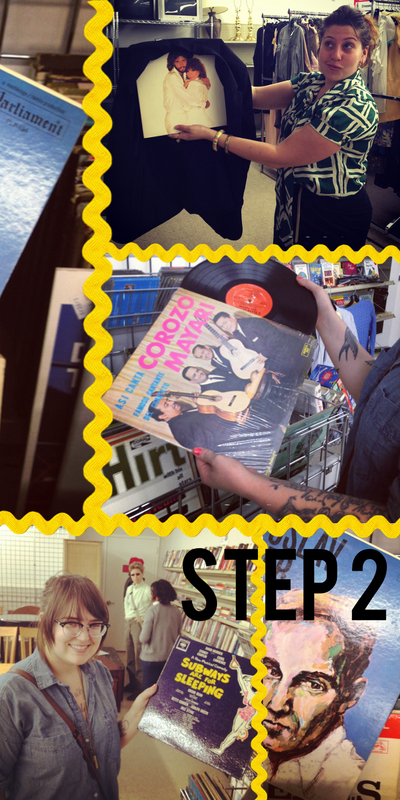 Step 2: Continue shopping at your local Goodwill, or thrift shop to find inexpensive records. Ours were $0.99 each, however many places sell classical albums for $0.25 a pop. Be warned! Sometimes the most AWESOME covers actually have the least attractive records inside. Don’t judge a book (or record) by it’s cover. The inside is what counts (in life, and in record shopping), so open the package and the sleeve and see what the record inside has to offer. This is what will be on display in the end product. Step 3: Preheat your oven to 250-300 Degrees Fahrenheit. Wipe down your record so it does not have extraneous dust – this will melt into the bowl. Make sure the record is dry. 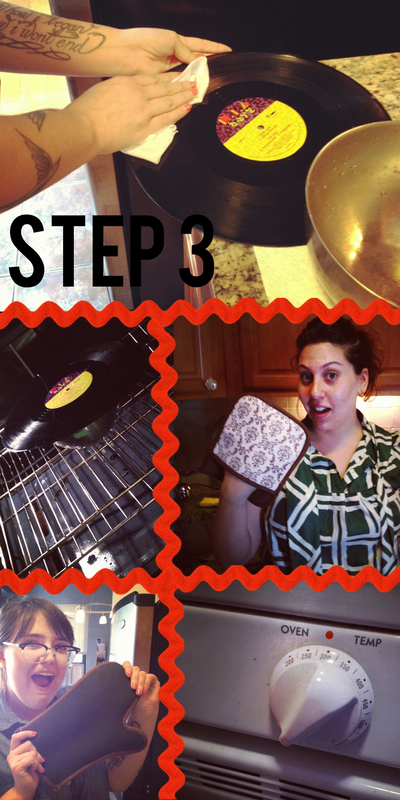 Place your record centered on an oven proof bowl. Place in the oven for no more than five minutes (it starts to let off toxic gas if left in too long) at a time. Open a window and ventilate. At five minutes (but sometimes sooner, use oven light to check if corners are dropping, melting, and bending) take out of the oven using oven mitts! Safety first! Remain calm! Don’t fret! Step 4: As soon as you take the record out of the oven (it will be hot) work quickly (less than 20-30 seconds) to shape the object. 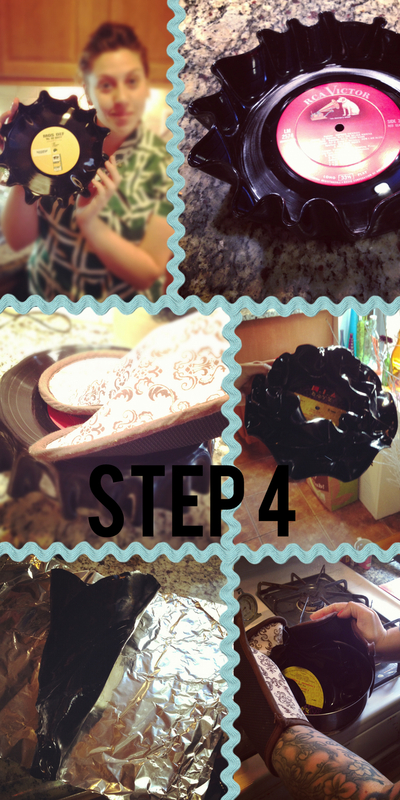 You can use the bowl as a mold, and press the record inside. You can also roll the record as you would when making a megaphone out of paper (lower left hand corner). If you are sculpturally inspired, you can even freehand mold the record into different shapes, or stamp the melted vinyl with pattern. If an object is not folding or forming to your liking, place it in the oven to soften it again for another minute or so. The vinyl cools and dries EXTREMELY quickly – usually in under a minute. 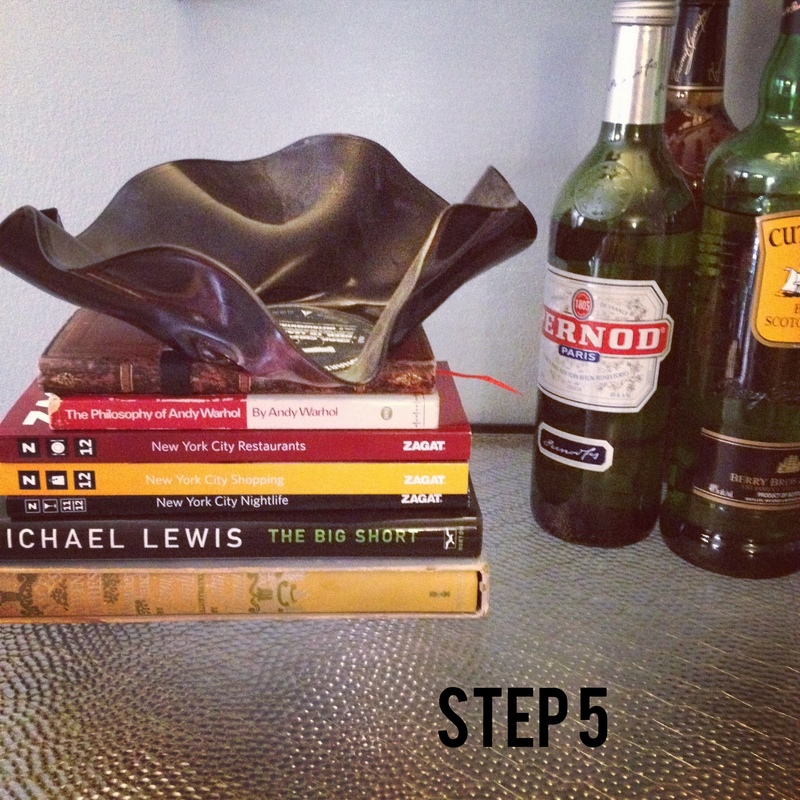 Step 5: Place and show off your object. Here I am planning on using the bowl to hold candy near my bar! Kimberley is using her rolled record (in the previous image) as a sconce or a plant holder mounted to the wall. 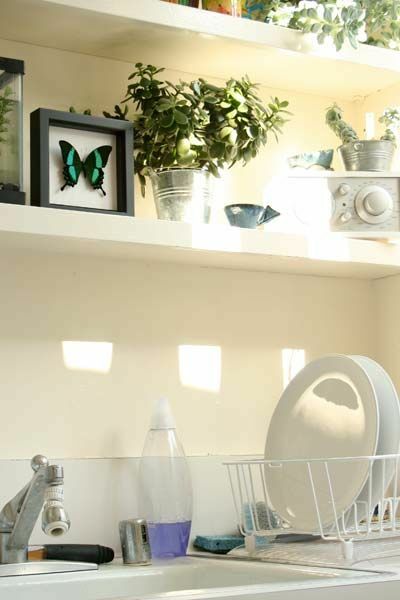 These bowls can be used as planters because of the hole in the middle makes automatic drainage! Since the item is so inexpensive to make, and takes such a short amount of time to form (some would say RECORD TIME, har har), I would recommend making a ton of them and giving them away to people you love as “just because” presents! What a unique and retro way to decorate. P.S. All photographs by me.